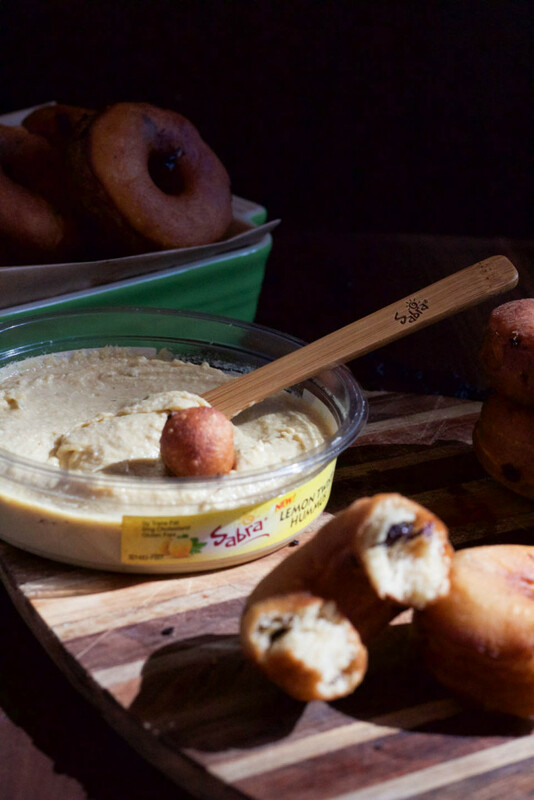 Disclaimer: This is a compensated post in collaboration with Sabra Dipping Company as a Tastemaker, using their hummus for #NationalDoughnutDay! As usual all opinions are my own. When Sabra asks you to have fun and get super creative developing a donut recipe using hummus for #NationalDoughnutDay, you do it! I was so happy and had so much fun developing this recipe. 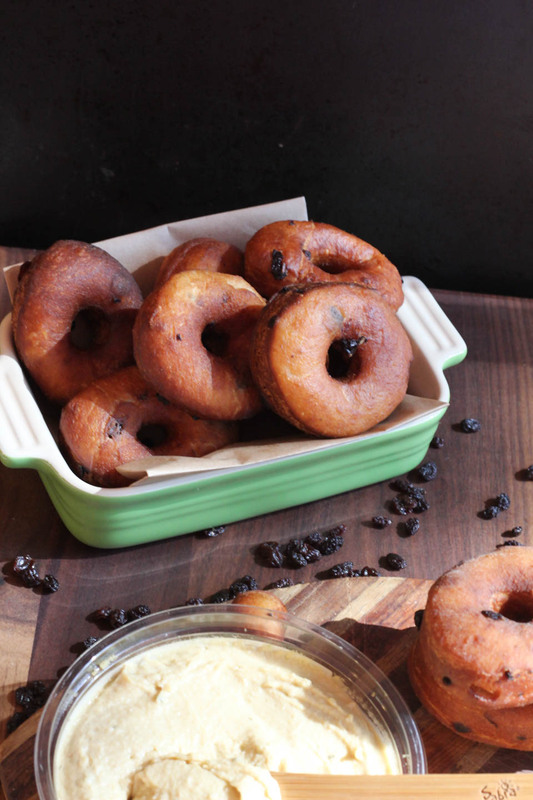 You would think it would be tricky coming up with hummus flavored donut recipes, but it really made sense. I don’t mess around when it comes to donuts, and roasted garlic. The two make a beautiful savory fluffy raised donut match. Savory donuts are totally a thing, a lot of people don’t like super sweet donuts. I am not one of those people, but you may be! And if you are, this is your recipe. If you’re not, this is still your recipe! Savory desserts, like cheese plates, are a a great allternative to sweet treats. And this donut can go great on a dessert table. But I was makeing these and it dawned on me to serve them as an appetizer, or tapa. 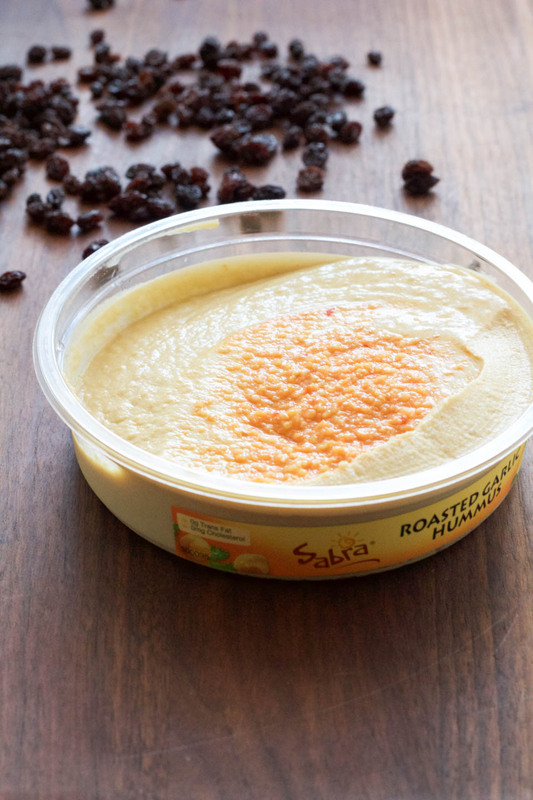 Tapas are small bites, so make them a bit smaller to serve with a tasty flavor hummus, like the Lemony one from Sabra. It went so well with the Roasted Garlic Hummus Currant Donuts. 1. Place yeast and warm water in a small bowl, whisk together using a fork. Allow to sit and bubble for 5 minutes. 2. Place flour, sugar, salt, Sabra hummus, milk, butter, and currants in the bowl of a stand mixer fitted with hook attachment. Once yeast is ready, pour into bowl. Mix on low to combine ingredients for a minute or so, once flour is incorporated, turn to medium high for 8-10 minutes, until dough pulls away from the sides of the bowl. 3. Turn off mixer, place a clean kitchen towel over bowl, and place in a warm area to double in size for 1 hr. I place mine in a warmed oven at 200 degrees. Turn off oven once you put the bowl in. Remove bowl from oven after 1 hr. 4. Turn dough out onto a lightly floured counter. Using a rolling pin, roll out to 1/2 inch thick. 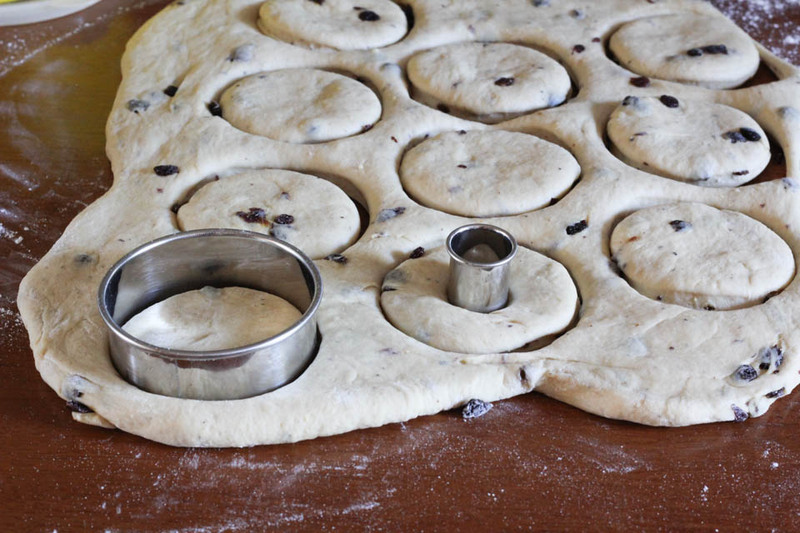 Using a 3 inch round biscuit cutter, cut about 20 donuts. Using a smaller 1 inch cutter, cut the center of each donut round to make the donut holes. Place the clean kitchen towel over donuts, allow to rest and raise for 5 minutes. Place raised donuts on a parchment lined sheet pan or cutting board. Have a paper towel lined large plate, cutting board, or sheet pan ready to place finished fried donuts on. 5. Place oil into a large pot or dutch oven fitted with a candy thermometer over high heat. Heat oil to 375 degrees. Using a metal slotted spoon or spider, place 3 donuts in the oil at a time, if you fry to many at one time the temperature of the oil drops too much and the donut will be oily. 6. Fry for 1 minute on each side, or until golden brown. Adjust heat as needed for temperature of the oil. Remove each batch and place on the paper towels to drain excess oil. Enjoy immediately! If leftovers, place in an airtight container for the next day. These cab be enjoyed as an appetizer with hummus for dipping, or as a savory dessert. 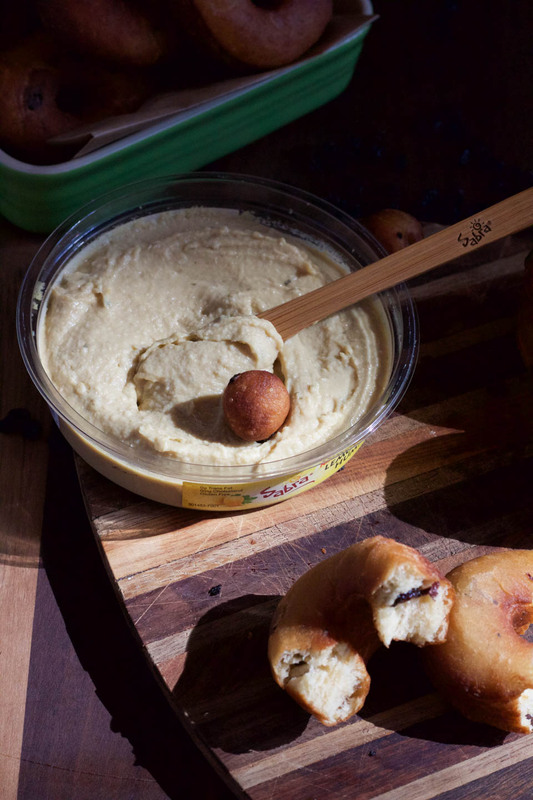 Other super awesome Sabra Hummus #NationalDoughnut Day Recipes from my friends! Wow I would have never thought hummus and donuts would ever be together. What a unique recipe! Me either and it works! Wow! what a clever take on a traditional doughnut! I definitely lean towards the savory side of life, so these would be perfect for me! Wow, this is so creative and it sounds like a great combination! 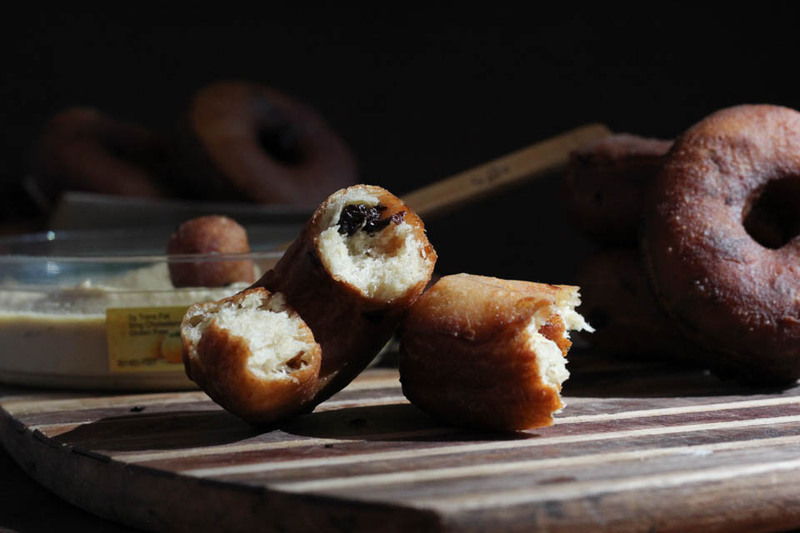 I really love the sound of savory donuts and just a touch of sweet from the currants too! It was oddly amazing and addicting. Ha! I could not agree more. Thank you so much!